Mamar puts enemies to sleep. 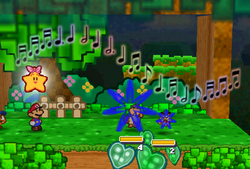 Lullaby is the second Special Move taught by the Star Spirits to Mario in the game Paper Mario. After Mario defeats Tutankoopa, who trapped the Star Spirit Mamar, she is freed from her card, upgrades Mario's Star Power Gauge and teaches him a new move, called Lullaby. When used, Mamar comes to the battle, and sings a soothing song to put enemies to sleep. The move requires one SP to use. This page was last edited on October 6, 2017, at 21:31.